Sometimes so there is a wish to indulge himself and the family with a simple and favourite dish from the far childhood which was prepared by our dear grandmothers and which causes continuous positive emotions. 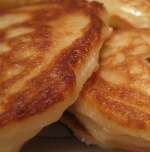 InfoHow.net will share the checked recipe and will tell how to prepare magnificent fritters on yeast. We sift a flour in ware in which we will cook dough. It is for this purpose better to take 2-3 liter pan with high sides. Add dry yeast, sugar and salt to a flour. To mix everything. Now it is necessary to pour in our dry mix in the small portions warm water, all the time stirring slowly that dough became such as dense sour cream on a consistence. If suddenly dough turned out thinnish - be not upset, add a little more flour for density. We cover our mixed dough and we put it in a warm place for 1 hour. After this time dough has to rise strongly. Now we warm a frying pan together with vegetable oil (better to take refined, flavourless) and a wet spoon it is spread in it dough. At first we fry on the one hand on big fire about a minute and without cover, then we overturn fritters, we close a cover and we reduce fire. We fry the second party of fritters about 2-3 minutes to a golden crust. It is possible to modify this recipe a little. For example, to make the same magnificent fritters on yeast with a stuffing, both with sweet, and with salty. To make it very simply: as soon as you laid out dough on a frying pan, at once strew from above each of fritters with any stuffing — the overwound boiled meat or polished apples with sugar. Close a stuffing a small amount of dough — a spoon add it from a pan. Fry the second party as usual — under a cover about 2-3 minutes to a golden crust. Spread ready magnificent fritters in a beautiful dish and give to a table with sour cream, or, depending on a stuffing, with jam or syrup. Bon appetit! Also share with us the impressions! Whether our oladushka were pleasant to you? What stuffing you tried to add to dough?